Yay! This was featured on Wandering Weddings! 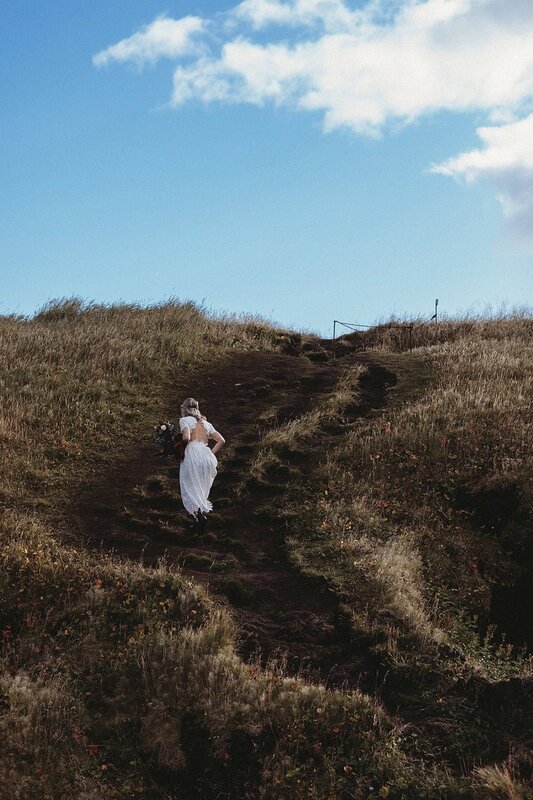 Holy Guacamole, this Iceland Elopement at the little black church in Búðir on the Snæfellsnes peninsula between Melissa and Ben was one for the books. It was off-the-charts-hard-to-top, and I mean it. 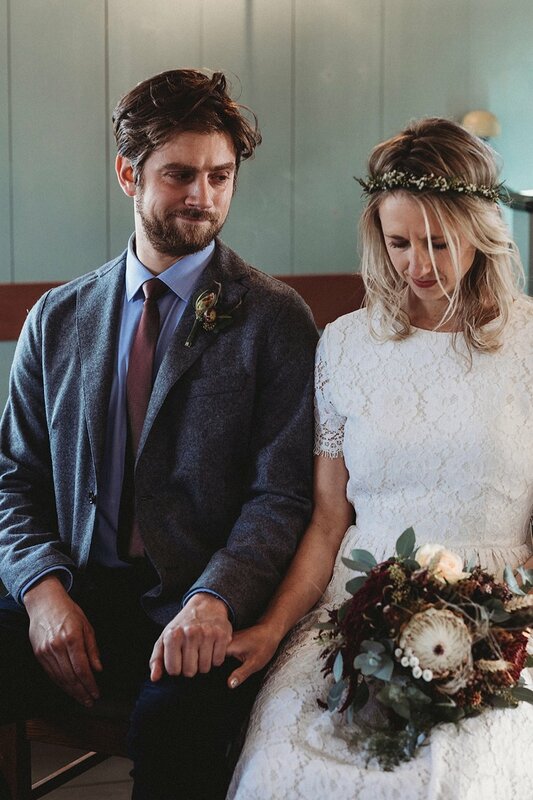 These two came to Iceland to elope, without telling anyone, keeping the day truly special between just the two of them. (And I was honored and lucky enough to have been chosen to document their story and love and tag along.) Their elopement encompassed every single reason why I LOVE to document elopements and feel like more couples should elope if that is what their hearts are telling them. The day was completely theirs, they did everything they wanted their way, loved on each other with no distractions, committed their love to one another, and then went on an adventure afterwards. It was completely magical, including the DOUBLE RAINBOW that appeared during their vows, ring exchange, and first kiss. AND A PUPPY PHOTOBOMB. 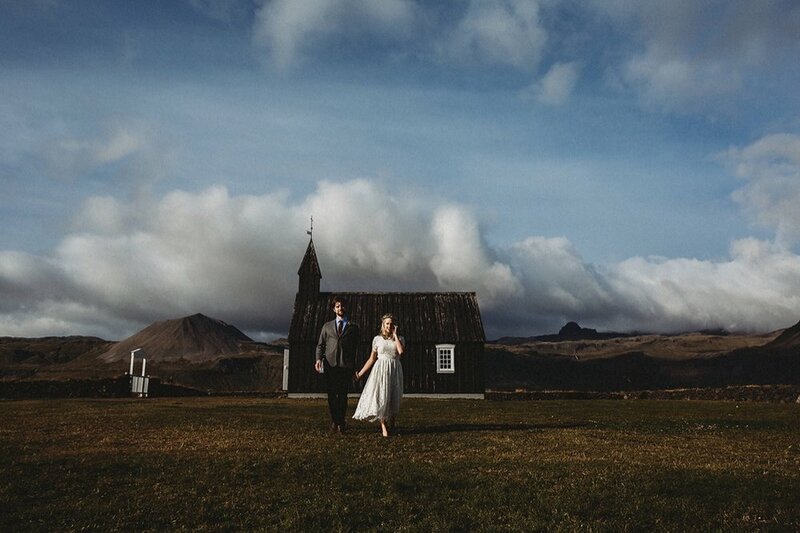 YES THIS IS REAL LIFE..
Melissa and Ben came to me with an idea in hand on their Iceland Elopement, a day they envisioned, and knowing that they were going to get married inside the Búðir Church. We worked together to come up with their itinerary for the day, I made sure to create something with some of the best spots in the area, and wanted to make sure to have fun. One of the benefits of hiring a local photographer is that we know where to go, what is dangerous, what is not going to be busy, best times to go to locations, etc. Melissa and Ben put their full faith in me and let me lead the adventure. They got ready at Hotel Búðir which is on the same property as the church and ABSOLUTELY GORGEOUS. They got ready in the same room, with Ben getting ready in the bedroom with the door closed. Unlike a lot of elopements, they decided on getting ready separately and to do a First Look, which I was SO EXCITED about. After they were ready, with me helping them each with some final touches on their outfits, Ben sent out first to the Búðir Church and set himself up for the First Look. I followed Melissa from the hotel to the church and it was wonderful. She walked so slow, calm, and with a smile on her face. The sun was hitting her PERFECTLY, so I asked her to stop in a tall field of golden grass for me to take a photo of her approaching the Búðir Church and out of NO WHERE this curious pup came out of the grass and booped my lens! I literally fell over backwards not knowing what animal was in my face, but hey, it’s Iceland, so it wasn’t anything dangerous! Afterwards Melissa and I both laughed HYSTERICALLY at this puppers who was now running away and continued to walk towards the Church. After their ceremony was over, we had another 3-4hrs to explore, which we did, through half of the Snæfellsnes peninsula. We had the sea, mountains, giant sea cliffs, a troll, and a glacier. It was seriously perfect, with not a thing I would change. Melissa and Ben have some words of encouragement about their experience Eloping in Iceland so read below for their insight. We chose a small, historic church located in the hamlet of Búðir to reflect our desire for an intimate and private ceremony. The surrounding area is the lava fields of the Snæfellsnes Peninsula which contains a stark beauty that deeply resonates with us. We worked with the local reverend to create an expressive ceremony that conveyed our care and love. We were lucky enough to find, at the last minute, the extremely talented violinist Abraham Brody to also be part of our day. You were right, Stephanie! We should have gone to the cave for our adventure photos after the ceremony. We explored the cave later in our trip and it was stunning. The moment when the violin music filled the church and the ceremony began. Emerging from the church to exchange our vows and seeing that Iceland had graced us with a rainbow. Invest in a professional photographer and musician -- it really makes a difference. Spend time planning a wedding that reflects the values of each individual in the couple as well as the nature of your relationship. Even after spending two months planning a simple ceremony, the moment still had the power to overwhelm and surprise us. How the small things (forgetting make-up, starting a bit late) just didn't matter in the moment. 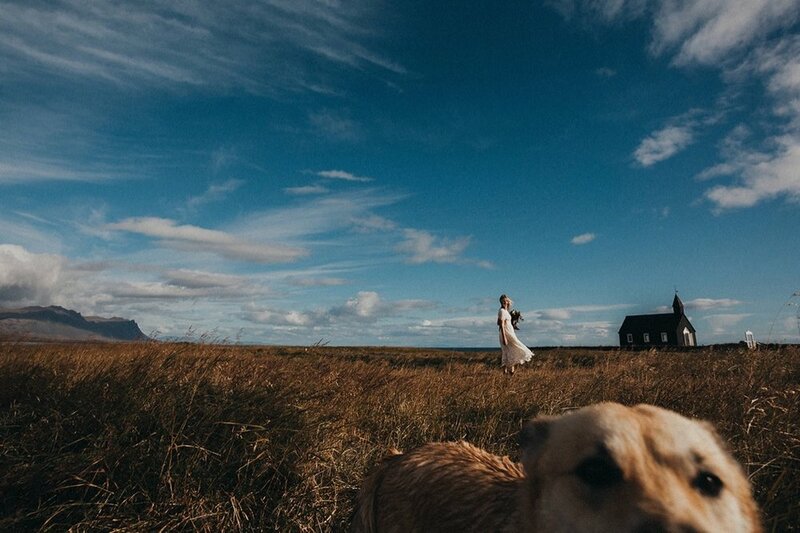 We loved Stephanie's deep knowledge of Iceland and her ability to capture the essence of our ceremony. She is an incredibly talented photographer and can create photos that embody the expansive beauty of Iceland and the romance of our wedding. Our wedding day would not have been the same without Stephanie. Want more Iceland content? Say no more.